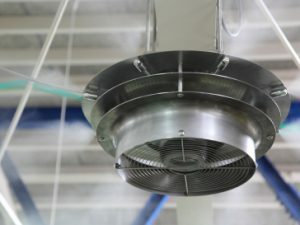 This industrial air-conditioning and humidification system uses fine fog (Semi-Dry Fog®*1) to control humidity levels throughout factory spaces with a ceiling height of 3.5 m (11.5 ft.) or more. Operable only with high-pressure pump, compressed air is not required. Compared to a standard steam humidification system, the running cost for our system is about 1/50, resulting in dramatic energy savings. Customers can choose between the LYOHMer®-C spray unit, capable of humidifying large spray volume in all directions, and the LYOHMer®-D spray unit, with low spraying capacity and more specific, focused spraying directions. Static charge prevention: Prevents/reduces troubles caused by static charge, such as product damage, (electrostatic damage) and debris/dust adhesion, etc. Energy saving: The running cost is 1/50 of a comparable steam humidification system, resulting in dramatic energy savings. Cooling effect: The system also yields a cooling of about 2℃, reducing temperatures with evaporative cooling (using the principle of heat loss due to water evaporation of Semi-Dry Fog®). Humidification and dust suppression in machine parts production, textile industry, agriculture, livestock, and warehouses, etc.